Emanuele Galiffi is a PhD candidate of the Centre for Doctoral Training (CDT) in Theory and Simulation of Materials (TSM). 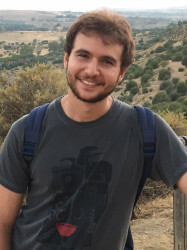 He is part of the Condensed Matter Theory Group, where he works with his supervisors Prof. Sir John Pendry and Dr. Paloma Arroyo Huidobro on the realisation of exotic wave phenomena, achieved by structuring materials over space and time. He completed his MSci degree in Physics at Imperial College in 2016, spending one year in Heidelberg (Germany) as an Erasmus student, where he collaborated with Prof. Sandro Wimberger (currently University of Parma). In 2017, he obtained an MSc degree in Theory and Simulation of Materials as part of the CDT programme. He is strongly involved in outreach, leading the preparation of the TSM Stand "Code for Creation" at the 2018 Royal Society Summer Science Exhibition, and currently president of the Imperial College Optical Society, OSA/SPIE student chapter at Imperial. In this framework, he regularly organises journal clubs and invited talks, with the aim of strengthening professional bonds among optics researchers across College. Finally, he works as graduate teaching assistant in tutorials as well as the physics helpdesk for undergraduate students within the Department of Physics. In his spare time, he enjoys rock climbing and playing the guitar.